Showing 2 of our total 3 reviews, with an average rating of 4 stars. 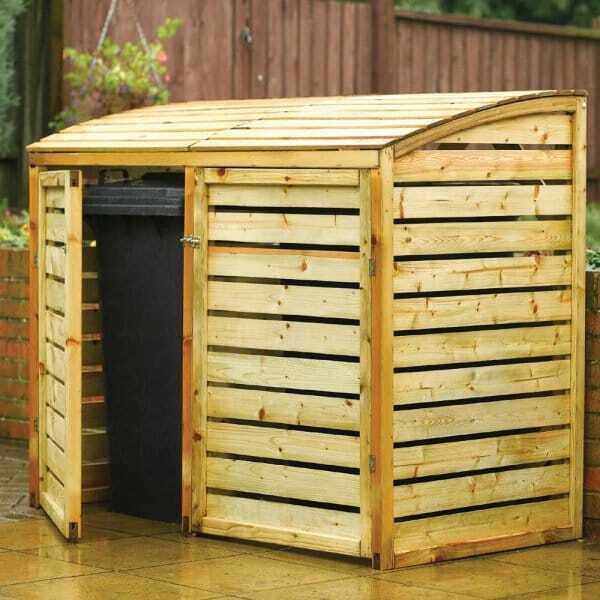 Read all 3 reviews for Rowlinson Double Wheelie Bin Store. Review - Very good product, Looks very smart outside our front door, much nicer and neater than horrid wheelie bins. We've received lots of compliments. Good price and delivery. Fairly easy to put together. Cheaper than anywhere else on the web. Great service. Very good product, Looks very smart outside our front door, much nicer and neater than horrid wheelie bins. We've received lots of compliments. Good price and delivery. Fairly easy to put together. Cheaper than anywhere else on the web. Great service. Review - This looks niceer than 2 bins standing in the garden! The wood looks very attractive. A bit tricky to assemble and instructions are not brilliant. Also I am going to fit a stronger bolt. Reasonable price though and overall very pleased. This looks niceer than 2 bins standing in the garden! The wood looks very attractive. A bit tricky to assemble and instructions are not brilliant. Also I am going to fit a stronger bolt. Reasonable price though and overall very pleased.